The Tigers did not have a great deal of success in the 1970s, but they had some interesting characters such as Mark "The Bird" Fidrych, John Hiller and manager Billy Martin. One of the most intriguing players of the period was center fielder Ron Leflore. He was originally scouted by the Tigers at a maximum-security prison where he was serving time for armed robbery. He eventually went on to have a successful nine-year career with the Tigers, Expos and White Sox between 1974-1982. Leflore had never played baseball until he joined a prison team in 1971, but he had a natural talent for the game. A fellow prisoner with connections to Martin was able to get the Tigers to give Leflore a try out. Leflore showcased his skills at Tiger Stadium while on furlough in June, 1973 and the Tigers were quite impressed. After being released on parole in July, he joined the Clinton Pilots, the Tigers Single-A affiliate in the Midwest League. 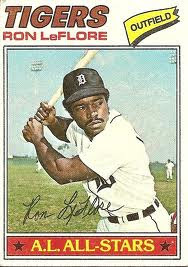 It took just one year for the speedy outfielder to reach the majors as he joined the Tigers in August, 1974 at age 26. He immediately held his own as the Tigers lead-off hitter and center fielder and developed into one of the team's best hitters by 1976. Between 1976-1979, he batted .310 with a 117 OPS+ and 243 stolen bases. Leflore was adept at pilfering bases, but there is more to baserunning than stolen base totals. For example, a good baserunner will go from first to third on a single or advance from second to third on a fly ball more often than a poor baserunner. Thanks to databases such as that at Retrosheet.org, those types of events are now tracked regularly. One of the most advanced baserunning metrics is BaseRunning Runs (BRR) found at at Baseball Prospectus. Developed by former Baseball Prospectus writer and current MLB team statistician Dan Fox, the BRR metric takes into account several types of base-running advancement. A complex algorithm estimates the number of runs which a player contributed to his team above what you would expect from an average baserunner. An introduction to the statistic can be found here. The Tigers BRR leaders between 1950-2011are shown in Table 1 below. The statistic is not available prior to that time as play-by-play data are incomplete. If data were tracked for earlier years, you would guess that the legendary Cobb would have appeared near the top of the list at least once. Ron Leflore was clearly the leader of the modern era Tigers though taking the top three spots on the table: 13.7 in 1978, 11.7 in 1979 and 10.5 in 1977. He also led the majors in BRR those seasons and his 1978 total was the seventh highest since 1950.